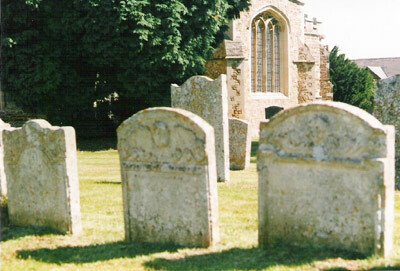 On this page I present a few images of the exterior of the Parish Church of St. Mary the Virgin in Gamlingay. If I can work out how to use the flash on my camera, I'll ask about taking some interior pictures one day: there are some wonderful carved choir stalls and misericords as well as a mass of medieval graffiti. For now, this is what you get, along with a page showing the church's gargoyles. 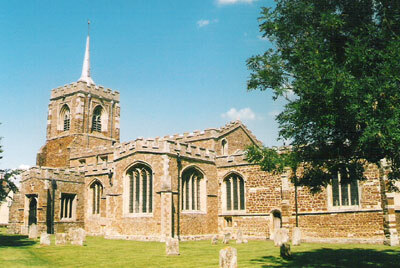 The Parish of Gamlingay in southwestern Cambridgeshire is part of the Diocese of Ely. Gamlingay was a Saxon village, and is mentioned in the Domesday Book, so it is likely that a church existed on this site at least from the Saxon period. This building was constructed in the thirteenth century, although the church's distinctive tower and steeple dates from the fourteenth, while most of the interior dates from the fifteenth century. 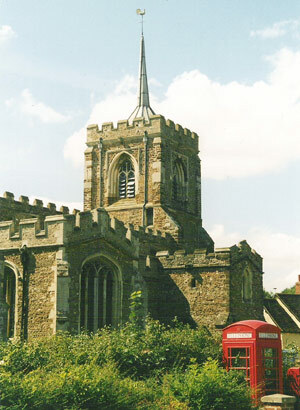 In this picture, taken from Church End to the north east, you can see the tower, the porch, and the north transept, with Gamlingay's grade II listed telephone box in the foreground. Scroll down the page for more images and comments. The church is still the highest building in the village, and is certainly the most distinctive. Gamlingay is in a slight dip on top of a ridge, and so depending on which direction you approach the village, you can either see the church from quite a distance, or you come upon it very suddenly. 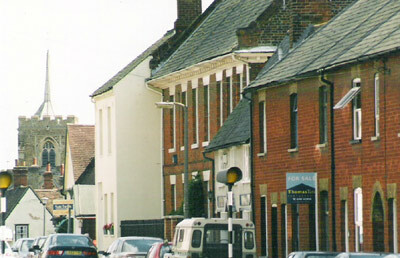 Here you can see the church from Church Lane to the south west, showing the churchyard, the south transept and the Guild Chapel. I can't do better than to quote James Brown: "Visible signs of death are everywhere: indented slabs of stone, their brasses long gone, memorial tablets, medieval stone coffin-lids, and, most obvious of all, the churchyard. 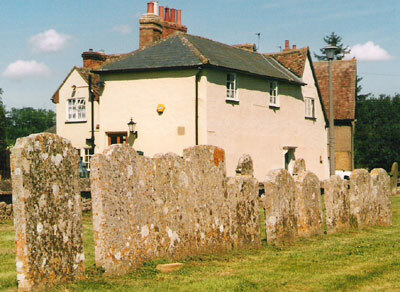 I do not mean the crosses and gravestones, which date from a later period, but the fact that the churchyard stands 3 or 4 feet higher than the surrounding land. It is, quite simply, full to overflowing with the mouldering bones of long-dead villagers." James Brown, Gamlingay: Six Hundred Years of Life in an English Village (London: Cassell, 1989), pp. 47-8. "Ask anyone for directions in England", the old adage goes, "and they'll give you a list of pubs and churches". The Wheatsheaf is just about the first thing you see when leaving the church, which is perhaps a welcoming sight after a long Sunday-morning sermon. On the other hand, leaving the pub after a long Saturday-night session, the first thing you see is this row of gravestones - which is perhaps a sobering thought!